A group of Europarliamentarians is about to travel to occupied parts of Western Sahara to assess whether including the territory in the trade deal with Morocco is a good idea. From 2 to 5 September, the first ever official fact-finding mission of the European Parliament to Western Sahara will take place. The mission has been set up by the International Trade Committee of the Parliament, which is at present reviewing the trade scheme for Western Sahara as proposed by the EU Commission, and still requiring Parliament's approval. The trade arrangement covering Western Sahara came on the back of a 2016 judgment by the Court of Justice of the European Union, concluding that no EU-Morocco Trade or Association Agreement could be applied to the territory, unless with the consent of the people of Western Sahara. The furious reaction of Morocco - seen by the EU as an important ally in countering both migration and terrorism - prompted the EU Commission to negotiate a new trade deal with Rabat, one that would explicitly contain Western Sahara in its geographic scope. A deal was initialed with the Moroccans in January 2018, and accepted by the EU Member States in June of this year - but still requires the green light of the EU Parliament to enter into force. The Policy Department of the European Parliament has published a report on the need for a coherent EU policy with regard to the three occupations of Western Sahara, Palestine and Crimea. In all three cases, plunder is illegal, the report states. Before a vote will take place in the plenary session, expected for December 2018 or January 2019, the International Trade committee (INTA) of the Parliament will issue an Opinion, advising Parliament to accept or reject the proposed Western Sahara trade deal. The rapporteur, Patricia Lalonde (French, ALDE), is expected to present her draft Opinion mid-October, which will be voted on in committee in November. As part of the committee's evaluation of the proposal, it decided to set up a fact-finding mission to the territory. The fact-finding mission is reportedly composed of 5 MEPs from different political groups. Western Sahara Resource Watch (WSRW) this week summarized the main concerns regarding the Commission's approach to the renegotiation. Download the WSRW brief 'The alternative facts of the European Commission with regard to the proposed trade arrangement for Western Sahara here. 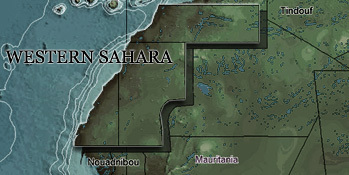 From what WSRW understands, the mission will only visit the part of Western Sahara that is under Moroccan military occupation. It will not travel to the part of Western Sahara that is administered by Polisario or to the Saharawi refugee camps in Algeria. WSRW was informed that the planned programme would consist overwhelmingly of meetings with Moroccan entities, such as economic operators and individuals with vested interests in upholding the Moroccan occupation, such as politicians elected in the elections held by Morocco in the territory. Reportedly, a mere two hour-slot would have been reserved for meeting genuine Saharawi groups. On 31 August, the European Parliament released a press release on the mission, stating that the goal of the visit is to assess whether the proposal Western Sahara trade deal “enjoys local support”. This goes against the core of the CJEU ruling on Western Sahara, concluding that the consent of the people of Western Sahara is required to apply an EU-Morocco trade scheme to the territory. The PR goes on to state that the mission will meet “official representatives of the territory”, which is manifestly incorrect: none of the listed interlocutors are the official representative of Western Sahara. In light of the framing of the visit prior to its departure, it is doubtful that the outcome of the mission will be anything else but a mere validation of the Commission’s unlawful proposal. The Polisario Front, the UN-recognised representation of the people of Western Sahara, issued a press release on 2 September 2018, stating that "institutions set up under Moroccan law have no right to express themselves instead of and on behalf of the people of Western Sahara." Polisario also invites the Parliament's mission to visit "the part of Western Sahara that is free from Morocco's occupation". Download Polisario's press release hereLow on ambition, high on propaganda", says Sara Eyckmans of Western Sahara Resource Watch. "Given the Court's emphasis on the need of obtaining the consent of the people of Western Sahara, it would make sense for the mission to actually make the effort of trying to meet with the people of Western Sahara. Many of them have fled Morocco's occupation. And those that suffer the hardship of living under the occupation, are offered a single slot on the agenda, in stark contrast to the number of meetings with Moroccan actors or agents of the occupation. Contrary to its title, this mission looks very much like an "alternative-fact" finding mission. Why then bother mobilizing parliamentarians all the way to El Aaiun when they have ample access to the Moroccan narrative back in Brussels?" The people of Western Sahara, identified by the Court as the party to consent to a trade arrangement affecting the territory, have not been approached on this proposal lumping their occupied homeland in with Morocco. In fact, the EU Commission has not made any effort at all to seek their consent. Deflecting attention from this essential issue, the Commission has resorted to undertaking a consultation process in which it has only heard from Moroccan elected officials and economic operators - falsely claiming that the Saharawi representation, the Polisario Front, and dozens of Saharawi civil society groups had also taken part. The Saharawi people have been unequivocal in their protest against the EU's plans to extend the trade deal with Morocco to Western Sahara, without as much as asking their permission. 1. How did you guarantee the independence of the programme and of your movements on the ground? 2. Did official Moroccan representatives accompany you throughout the visit and during your meetings? 3. Did staff from the EU Delegation to Morocco and Member States' Embassy in Morocco accompany you in the territory? 4. Whom did you meet and what was the share of genuine Saharawi interlocutors, as opposed to pro-Moroccan voices, in your two-day programme? 5. Did you consult with MINURSO and the office of UN Special Envoy Horst Koehler before and during your trip? 6. Why did you not travel neither to the part of Western Sahara outside Moroccan occupation, nor to the Saharawi refugee camps in Tinduf? 7. Did you raise the issue of how the consent of the people of Western Sahara was secured by the European Commission? 8. How do you assess the benefits that would accrue from the proposed agreement to the people of Western Sahara as a whole (in the occupied territories, in the liberated territories and in the camps)? 9. What were your impressions about the situation of human rights, notably freedom of expression and association, in the occupied territories? 10. What are the next steps and follow-up of your mission?